77440 ENT RUSSIA (1931) Nurse bandaging wounded man*.Train*. Plane*. 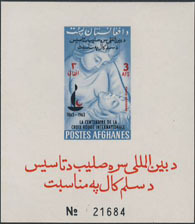 10 kop postal card urging citizens to buy lottery tickets to support Red Cross and Red Crescent. 5076 EMA ETATS UNIS (1945) Croix Rouge. Empreinte rouge de machine à affranchir sur pli Pitney Bowes No 95567: "Donnez maintenant, donnez plus au fonds de guerre de la Croix Rouge." 73653 MAX SAAR (1956) First Aid station*. Maximum card with First Day cancel. Scott No B108, Yvert No 352. 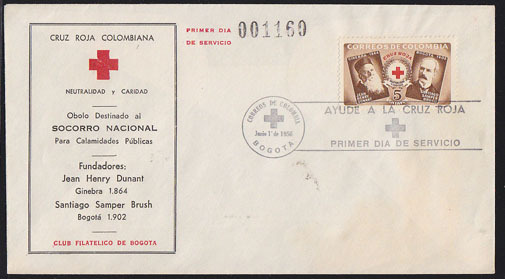 75979 FDC COLOMBIA (1956) Founders of Colombian Red Cross*. 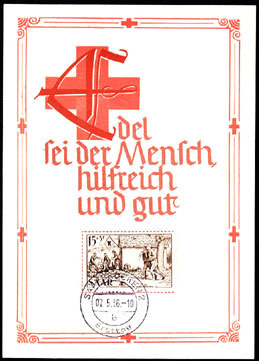 Cacheted FDC. Scott No RA55. 31788 ND TOGO (1959) Infirmières*. Malades*. Séries de 3 émissions pour la Croix Rouge, en blocs de 4. Yvert Nos 292-4, Scott Nos B12-14. Difficile à trouver! 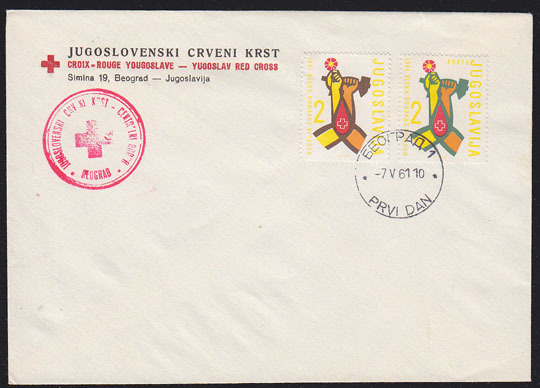 76031 FDC YUGOSLAVIA (1959) Red Cross centenary*. Unaddressed FDC. Scott Nos RA21,RAJ18. 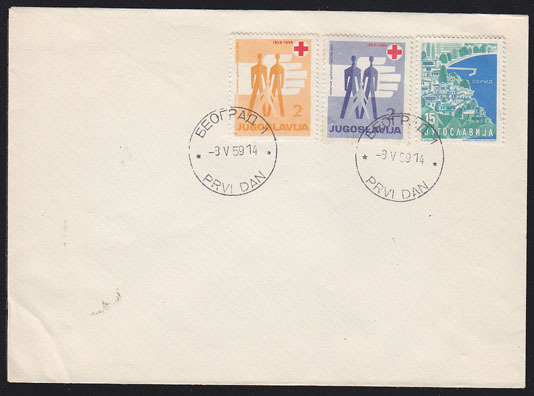 76032 FDC YUGOSLAVIA (1961) Blood donation*. Unaddressed FDC. Scott No RA25. 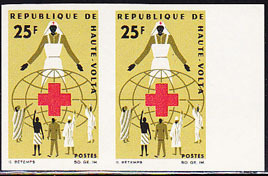 58407 ND DAHOMEY (1962) Red Cross nurses*. Map*. Imperforate. Scott No 159, Yvert No 178. 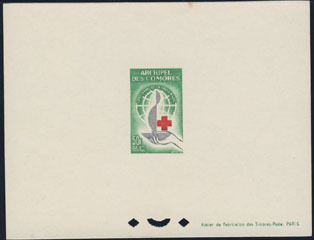 58767 EL COMORO ISLANDS (1963) Red Cross centenary. Deluxe sheet. Scott No 55, Yvert No 27. Small toning spot in upper margin. 60713 ND UPPER VOLTA (1963) Red Cross centenary*. Imperforate. Scott No 127, Yvert No 129. 58088 ND AFGHANISTAN (1963) Nurse with patient*. Imperforate S/S. Scott No 662K. 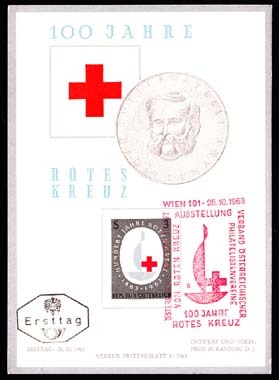 37218 EP AUSTRIA (1963) Red Cross emblem*. Black proof. Scott No 710, Yvert No 973. 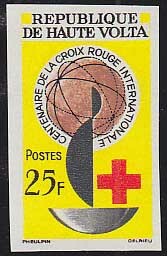 Centenary of Red Cross. 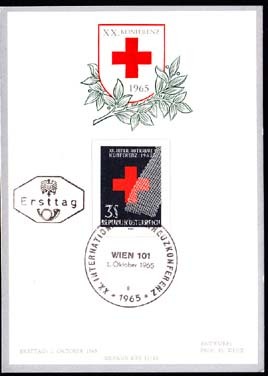 73154 MAX AUSTRIA (1963) Red Cross centenary. Maximum card with thematic cancel. Scott No 710, Yvert No 973. 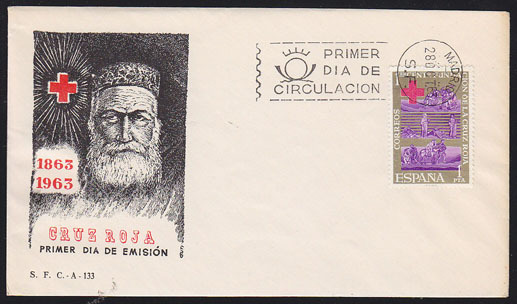 76013 FDC SPAIN (1963) Good Samaritan*. Unaddressed FDC with cachet. Scott No 1195. 77056 ND DUBAI (1963) Dhows. Tent. Camels. Butterfly.*. Set of 4 imperforate blocks of 4. Scott Nos C9-12. 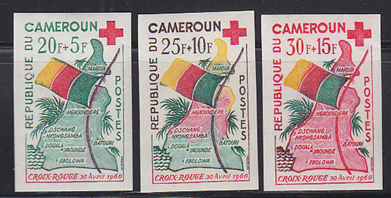 60461 ND CAMEROUN (1965) Ambulance*. Nurse*. Set of 2 imperforates. Scott Nos 413-4, Yvert Nos 394-5. 73149 MAX AUSTRIA (1965) Bandage*. Maximum card with thematic cancel. Scott No 752, Yvert No 1030. 60712 ND UPPER VOLTA (1966) Red Cross worker*. Imperforate pair. Scott No 167, Yvert No 159. 41627 ND NIGER (1967) Nurse*. Doctor*. 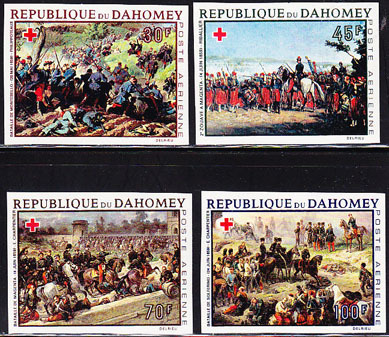 Set of 3 imperforates. Scott Nos 199-201, Yvert Nos 202-4.